New Delhi: Google.org today announced grants of US$8.4 million to four Indian NGOs including Learning Equality, Million Sparks Foundation, Pratham Books StoryWeaver, and Pratham Education Foundation over the next two years to expand and scale the work they are doing to enhance the learning experience for students in the classroom. These grants are part of a global US$50 million commitment that Google.org made a fortnight ago and will go towards supporting nonprofits that are building tech-based learning solutions. Grants from Google.org will be used to scale existing initiatives to reach more children, and to build more innovative and engaging tech-based learning solutions to close the gap in learning and academic opportunity. Since the implementation of the Right to Education act in 2010, there has been much progress in India with respect to infrastructure, enrollments and literacy levels. But the inequity in the quality of education continues to grow. Various studies show a decline in learning levels among school students. MHRD data indicates there are about 260 million children enrolled in schools across the country, but a recent survey by Pratham Education reveals 50% of all children in 5th grade cannot read a 2nd grade text or do a two-digit subtraction problem. In the National Policy of Education report 2016, poor learning outcomes have been attributed to serious gaps in teacher motivation and training. Lack of access to relevant educational material, tools and aides that enhance the classroom experience are some of the other areas that must be addressed. “Google has never taken a conventional approach to solving problems, and neither does Google.org. Our approach is to find the most promising non-profits and put the best of Google- our philanthropy, our people, our products- to work and help them close this gap,” said Rajan Anandan, VP South East Asia and India, Google. The education grants in India will focus on three areas where technology can be used to improve the quality of education. First is to make available quality learning material that overcome language and connectivity gaps. Second is to provide better training and support to teachers as they are key to educational outcomes. Finally, it is to support students beyond classroom learning. Pratham Books has created StoryWeaver, an online platform whose open source technology connects readers, authors, illustrators, and translators to create free stories that can be translated, remixed, and even newly authored. Parents and teachers can easily find stories that fit their students’ reading level and language preferences, and all Storyweaver content is free and can be easily accessed, downloaded, or printed. Today Storyweaver offers books in over 60 languages. 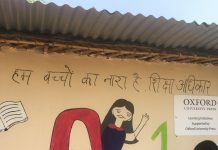 With support from Google.org, Pratham Books aims to dramatically increase Story Weaver’s reach, aiming for more than 500,000 active users and 20,000 titles. Pratham’s Hybrid Learning Program empowers students to use self-driven, tablet-based curricula to learn outside of the classroom. Students ranging from grade 5 to 8 self-organize into groups of five. Two groups share a tablet, and children in each group decide together what content they’d like to learn. Along with learning science, English and math, students also learn how to work collaboratively with their peers and foster their curiosity. The data collected from the grant run program will help Pratham and the broader sector better understand how a student-focused model can accompany more traditional teacher-focused models, with the hope of scaling these methodologies across India’s rural school ecosystem. The Million Sparks Foundation with ChalkLit, a digital content platform and social community, supports high caliber teaching with lesson plans, learning modules, videos etc. ChalkLit content is divided into bite-sized chunks and organized to align with public curriculum standards, and accessible by teachers via a lightweight mobile app built for users with limited connectivity. The organization has built a free open-source software to bring online materials—including books, video tutorials and quizzes. Their platform, Kolibri, runs on numerous devices and helps educators access, organize and customize digital content, even in the most remote locations. The program in India will be managed by their local partner Motivation for excellence. In addition to the funding, Google.org brings these grantees into the company and gives them access to its best thinkers. Googlers with relevant skills help accelerate the impact of these grantees, and Google provides products and tools which help them scale solutions. Previous articleCambridge English BEC Exam packages now available on Amazon.in!